Sea to Summit's AlphaLight Long Spoon is an ultralight, anodized aluminum spoon that, due to its superiority, has replaced the Titanium Spork I've carried for nearly 15 years. Most of us have done it...Finished off the last of our Mountain House meal by digging into the bottom of the bag and allowing our hand to be covered in tomato sauce or other goo. It seems to go with the territory. Let's start with a short, slightly narcissistic video. For 15 years, my Snow Peak Titanium Spork has been my companion on every camping adventure, but earlier this year, I stumbled upon the Sea to Summit AlphaLight Long Spoon. There was, of course, a moment of indecision. I mean, I've had my spork almost as long as I've had my wife, and I'm a pretty committed person. Oh, but that AlphaLight Long Spoon tempted me...with its extra long handle, promise of being lighter, and $8 price tag (Honestly, $8!!!). I decided to begin my affair with this spoon. Let's do some side-by-side comparisons. First, the AlphaLight Long Spoon is a full 2" longer than the Snowpeak Titanium Spork. Sure, in everyday usage, the AlphaLight Long Spoon comes across as freakishly long. HOWEVER, it was designed for those eating freeze-dried meals from the pouch. Puny spork that can't reach the bottom of the bag. Svelte spoon that takes keeps my hand out of the bag! Third, the mini-biner proves to be very handy in keeping the spoon where you can find it. 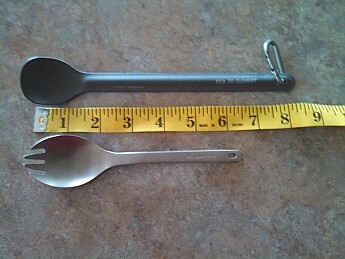 Yes, some silly utensils fold or slide in order to fit into your cook kit (This would be a good moment to mock this item https://www.trailspace.com/gear/gsi/telescoping-foon/.). Since the AlphaLight Long Spoon isn't going to fit into my mess kit, the biner is great for securing my spoon in a place where I can easily find it later. 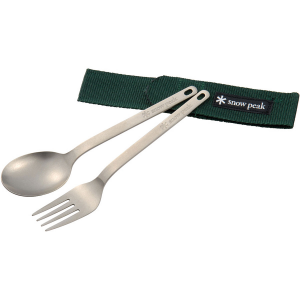 The Snowpeak Titanium Spork has a small slit in its handle, I suppose, to tie a string through. Fourth, the spork wins in the category of being able to stab food. Let's face it, a spoon (or the [giggle] GSI Telescoping Foon) lacks the utility of a spork. And the spork has a larger bowl for holding solid food....BUT both the spork and spoon only hold 1 teaspoon of liquid in its bowl. Although the spork looks significantly bigger, it's an illusion. The very tines that I like about the spork mean liquids are limited to 1tsp. Soup eating is equal in this equation. I wish the bowl on the AlphaLight Long Spoon was a full Tablespoon. Otherwise, I find it superior in every way to my 15-year-old spork. 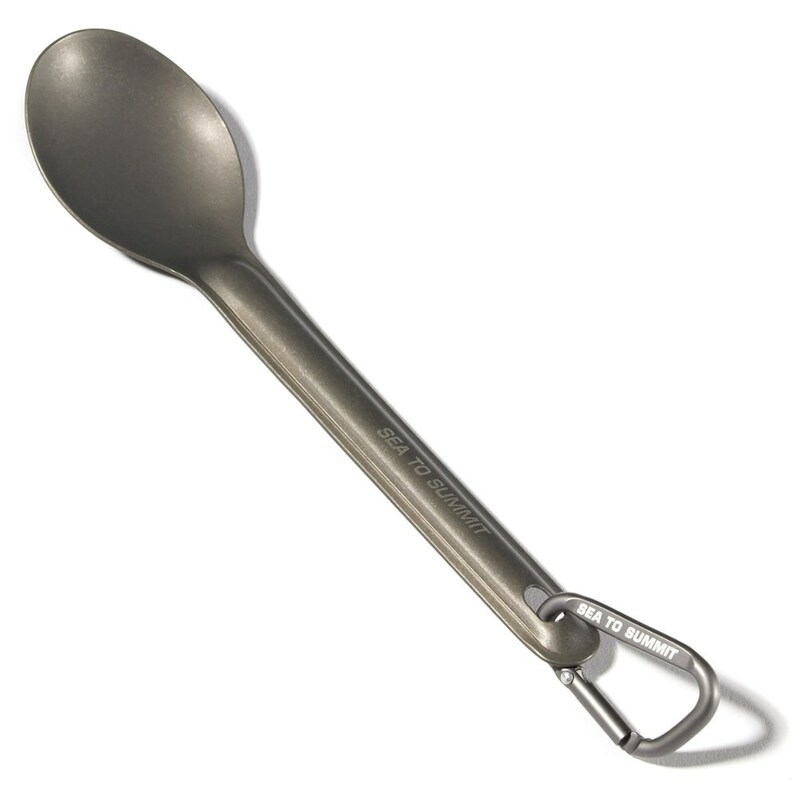 Of course, the question is will the AlphaLight Long Spoon last as long as my titanium spork? You're not alone in that theory, Goose. I still don't get why they'd get rid of the long ti spoon. It was a simple, but good, product. REI's $2.00 Long Spoon weighs .5 ounces, is the same length, and has a larger bowl. 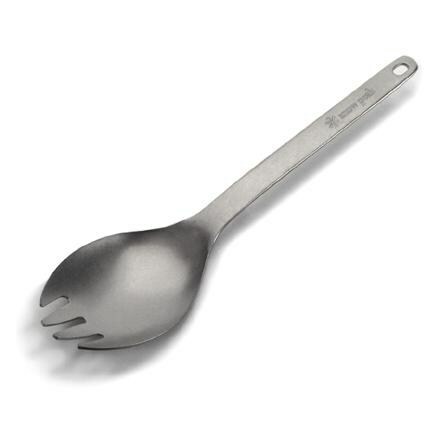 To further muddy the waters, Soto Outdoors has introduced the folding Pocket Spork OD-SPK. It has a titanium bowl that appears will hold more than the Snow Peak spork or AlphaLight Long Spoon and a stainless steel handle. When opened it's 7.3" long; closed it is 4.3". Soto says it weighs 0.78 oz. No muddying. 7.3" won't reach the bottom of the bag! Hehe, good review. I usually cut a few inches off the top of the foil bag to avoid "gravy fingers". On the subject of REI retiring things ... Clearly they put their name on other manufacturer's stuff. I'd bet a quarter the REI merino wool base layer I have was made by Smartwool, cause REI stopped selling their branded merino about the same time they started carrying Smartwool. And doesn't the REI spoon look an awful lot like S2S? A lightweight long spoon made for eating meals out of dehydrated pouches. High quality aluminum alloy. 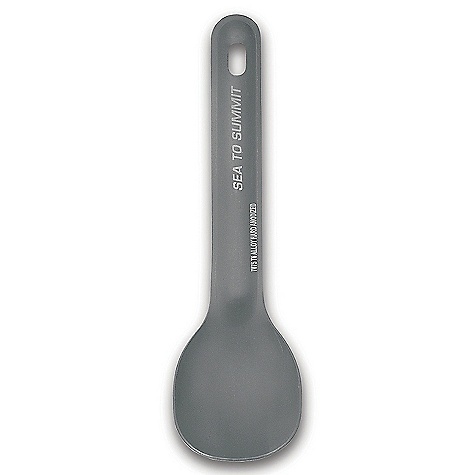 The spoon is hard anodized, to prevent chemicals leeching into food. 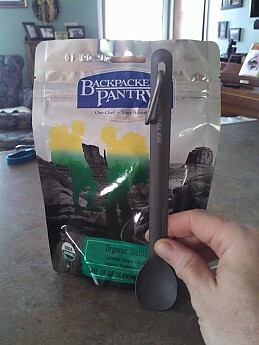 A great spoon for multi-day backpacking trips when food weight matters. The long spoon allows me to keep my backpacking kitchen light: spoon, Snow Peak mug, and fuel canister stove. The spoon is a couple inches longer than regular sized spoons, which means you will not get food on your fingers when digging the last spoonfuls out of a dehydrated meal pouch. I regularly do 4-day, 3-night solo loop hikes. I carry Mountain House dehydrated meals: 3 breakfasts, and 3 entrees. The rest of my food is made up of a mix of cereal bars, jerky, Slim Jims, coffee singles, Nuun tablets, and powdered Gatorade. Because all my prepared meals are re-hydrated, the long spoon is the only piece of cutlery I carry. If you regularly eat out of pouches, this spoon is an essential piece of gear as far as I am concerned. Thanks for the review, Jerry. Long spoons are pretty essential for eating out of a pouch. Will never need another spoon in the backcountry! Will never need another spoon in the backcountry! I love this spoon! 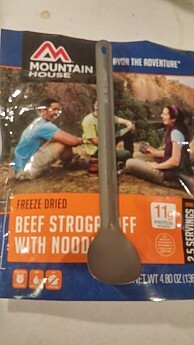 It works great with freeze dried meals due to its length. 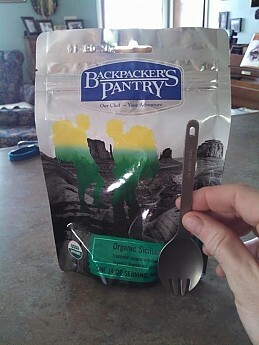 I bought this spoon last year after a friend recommended it for use with freeze dried hiker dinners. I love it! It's the only piece of silverware I bring backpacking. 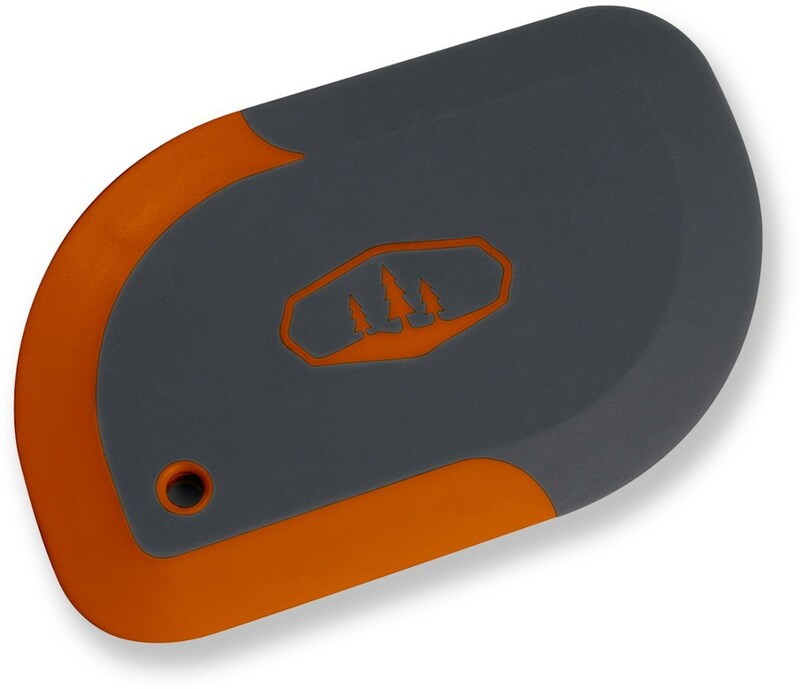 It comes with its own mini carabiner to hook onto a bag or camp kitchen line or hook. I just bought one for my son too because he took mine on a trip and loved it as well. A nice, super light, long handled spoon, for getting into those nooks and crannies. If you are like me, and use "cook in the bag" meals for backpacking, you have experienced the frustration of digging into a cook bag with a standard size spoon, and making a complete mess of it. The food can get all over your hands, making one bear bait by bedtime. Enter the Sea-to-Summit long handled spoon. Not much to say about it except that at 8.5 inches, it is plenty long to get into the depths of any size cook-in bag, so you don't miss any tasty goodness. And at .4 ounces, it will hardly weigh you down. The spoon is made from sturdy aircraft-grade 7075-T6 aluminum alloy, and after several seasons of use, shows NO signs of wear. I expect this thing to last for decades. There is a tiny carabiner attached to the handle, though I'm not sure it's big enough to be useful. Interestingly, Sea-to-Summit makes a titanium version of this spoon, which weighs .2 oz more than the aluminum version, which costs significantly more! Yes. Yes. and Yes. Thanks for the review, David! "Bear bait by bedtime" — sounds like a good horror story. Thanks for the review, David.